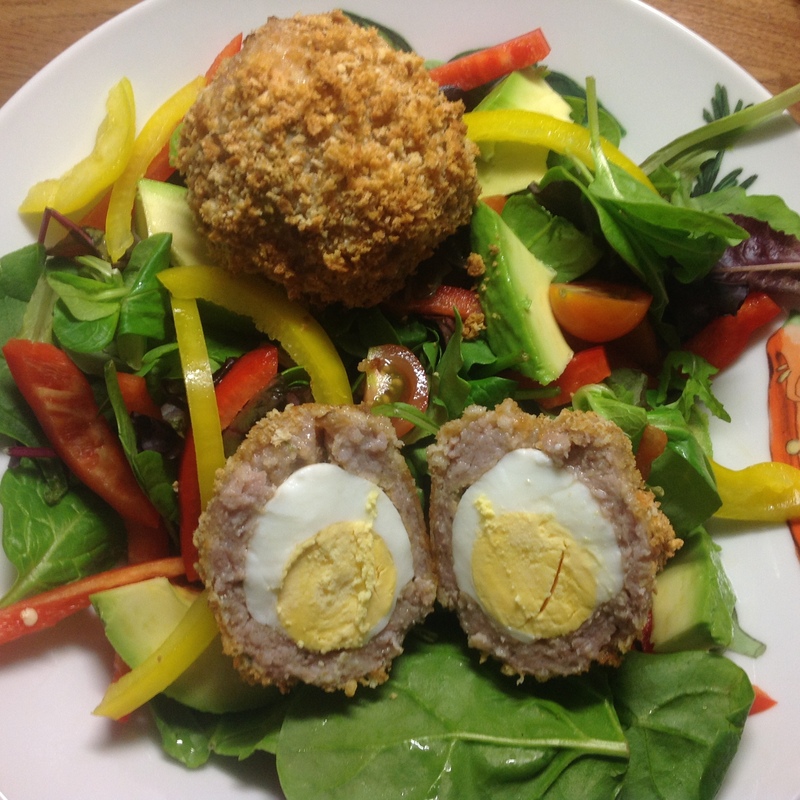 By Heck it’s Nanny’s Scotch Eggs! Mia has always loved scotch eggs, but gluten free ones are hard to find. We were chatting to Mia’s Nanny who had just made some which contained gluten and we realised that they could be easy to adapt into a gluten free recipe. We tried them and they were delicious! We ate them as a main meal with potato wedges and a hearty salad. Put only 5 of the eggs into a saucepan, fill it with water, cover and boil on the hob. Boil the eggs for 8 minutes. Timing starts from the point the water boils in the pan. As it boils, turn the heat down to simmer. When the eggs have boiled, take them off the heat, put cold water into the pan and take the shells off. Leave them to fully cool down. Meanwhile, take the sausage meat, parsley, salt and pepper and mix together. Set this to one side. Take out 2 small plates and a small bowl. Put the remaining egg onto one of the plates and beat. Set aside. Take the other plate and put the flour onto it. Set aside. Put the breadcrumbs into the small bowl. When the eggs have cooled, take one at a time and coat it in sausage mixture. You can really squidge the meat around the egg to bind it together. Then roll this into the flour, then roll it into the beaten egg and then roll it around in the breadcrumbs until it’s completely coated. Place it in an oven proof dish. Repeat for all of the eggs and then cook in the oven for 30 minutes. You could also add a small amount of sesame seeds or cheese to the breadcrumbs mixture to add another flavour to the scotch eggs.